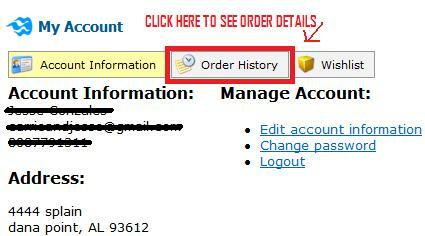 2nd, After you have logged into your account you will follow these directions to check on your order status. If your order shows it is "New"
We are in the process of validating your billing and order availability. Tracking is NOT yet available. Please note you will be auto-emailed your tracking so please be sure to add us to your contacts to avoid losing emails to the "spam folder" AOL users is a must! If your order shows it is "In Progress"
What does "In Progress" mean? If your order is in progress this could mean that that your credit card was declined or further infomation is needed to complete the transaction. Also if you chose to take advantage of our 3% discount on payments made in the form of money orders, wires, bofa walkin payment, your order will be placed in progress until payment is recieved, once received we will move your order to the ready to ship catagory. If your order shows it is "Ready to Ship"
Within the next 2-3 business days the ready to ship process should be finished (provided there are no unforeseen issues) your order will be designated by our staff to be moved into the "Complete" category. Until your order is in the "shipped" category a tracking number WILL NOT be available. This is not a small package such as a laptop or even a refrigerator but is a large crate that has a motor vehicle inside it. Before it can go on an enclosed container (freight truck) it must meet both state and federal HAZMAT regulations. This means that it is illegal to knowingly ship a motor vehicle that has combustible fluids in it (gas) or leaking fluids of any kind, such as petroleum. For tracking request until you see shipped’ please allow our staff the time to correctly process your order too lower inbound phone calls during busy seasons. we have inspected it for leaks, scratches, damages, and most importantly have verified your vin number and engine number match the manufacturers certificate of origin and is on file with the federal department of transportation, then it is ready for the shipped category, once this process is completed the trucking company will be notified, the order will be moved to the shipped category and approximately one day after it is shipped you shall receive tracking numbers. If your order shows it is "Shipped"
Tracking will be in your account at this time and most likely have been auto-emailed to you. Please check your spam folder if you did not receive any emails from us by this point as we have already sent about 5 emails. If you have your tracking number, you should visit www.yrc.com , call them and pre-schedule your delivery block.